Do you need that business loan? “I begun with 70 broilers, and next time I kept 220 and it went on till now I have 350 chicks and I’ve booked 600 chicks …. I want a loan.” This was an actual inquiry for help by Robby, a member of a farmers’ group am subscribed to. Robby’s inquiry didn’t come as a surprise to me as I have seen similar tendencies exhibited by many small business owners. From that brief message, one can see that Robby started off small (like we all usually do) and managed his resources with passion. This saw his flock grow in size five times. Considering the success he has registered, he now wants to rear nearly three times the current flock size by acquiring more birds. Unfortunately, he seems resource constrained. Passion yields Progress: The phenomenal growth experienced by small businesses especially in the early stages is usually more about the passion than abundance of resources. Robby must have balanced the few resources he had in place and excitedly worked tirelessly to see that he looked after these birds in the best way possible. He most likely achieved this by investing alot of personal time. This naturally gave way to positive returns hence the remarkable five fold growth in flock. Excitement comes before a downfall: Robby is clearly excited and very pleased with his achievements. While that in itself isn’t a bad thing, he needs to avoid succumbing to the ‘fast growth‘ syndrome that the media subjects us to. Alot of praise is usually heaped onto businesses that achieve so much in so short a time without mentioning the underlying catalysts to that progress. While he may have this grand plan of having a 10,000 broiler farm, the steps towards that vision should be measured. Deciding to borrow money to engineer your growth without looking at the holistic implications could turn out to be your nemesis. There is still alot he needs to understand about the business in order to grow it sustainably. Organic is better than Artificial: In Uganda where the cost of capital is very high with interest rates ranging from 25% to 30% per annum, one can hardly achieve a profitable growth in a legitimate business by opting to borrow money. An organic approach that would see Robby re-invest his income regularly and consistently is much better off than rushing for a loan. While it may take longer to achieve the much desired growth, the organic approach would help him achieve two things; One, he gets a chance to experience the growth pains of the business a stage at a time without leap frogging (usually called the Entrepreneur’s school fees) thereby giving him a more solid foundation and Two, he has a better chance of growing with his clientele (most people like rushing to acquire big already established clients but their demands tend to lead small businesses into a wall. Often times it is better in the early stages to get clients that are within your supply ability and grow based upon their demand). Understanding market stability: Robby needs more time to understand the market dynamics fully. While he may have sold his 200 birds with ease, the timing and size of flock might have been in his favour. What happens when he has 700 birds that he needs to sell off at once and the market demand is low? Every extra day that broilers stay on your farm after they are due for sale means increased overhead costs. Losses are likely to ensue and matters would be worsened by the demand of the bank loan. Management is a puzzle: Like I pointed out earlier, due to passion, Robby might have played a very big role in managing the flock thus far. With increasing numbers, he’s likely going to look for staff to help him out. Is he sure that the staff are going to do the job with the same zeal as his? Any drop in the level of care for these birds has a direct implication on the eventual income attained. In any small business, it’s always a challenge getting staff to work with the same zeal as the visionary considering that most come primarily to make money. 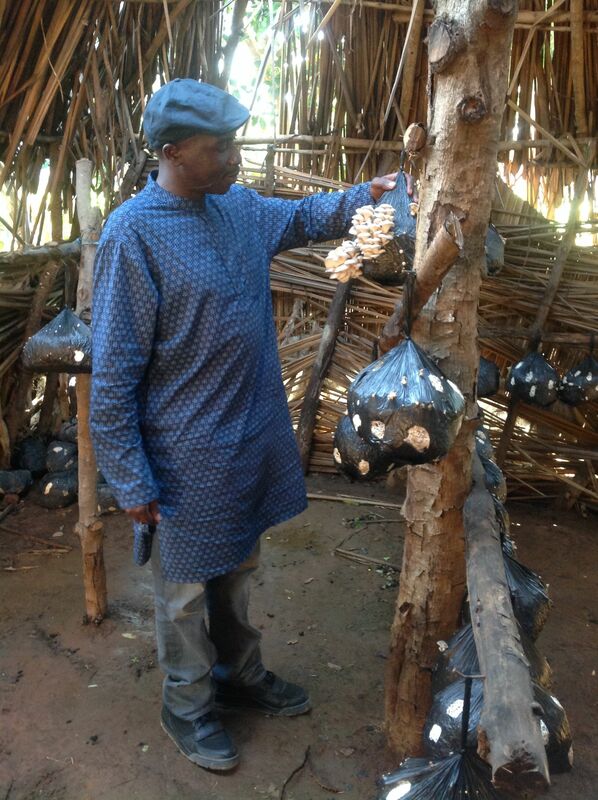 The author assessing the supply potential of a mushroom farmer. Busolwe Town Council, Butaleja District, Uganda. To my dear friend Robby, while borrowing money may look like the most obvious option, I advise you to step back and assess the options available to you. Having to pay interest rates of 30% per annum on capital for a business generating you not more than 25% gross profits is a recipe for disaster. You by now know too well the kind of competition in the poultry business. This entry was posted in Business and tagged agribusiness, business, small business, sme. Bookmark the permalink. Good staff James, am always following.